Actually a volcanic glass covered in spots of minerals frozen before they could fully solidify, Snowflake Obsidian has the ability to bring things to the surface (whether they be positive or negative, such as love, anger, or secrets) albeit gently, while providing balance during times of change, and assisting it’s owner to see patterns in life so that the repitition is used in a positive way. 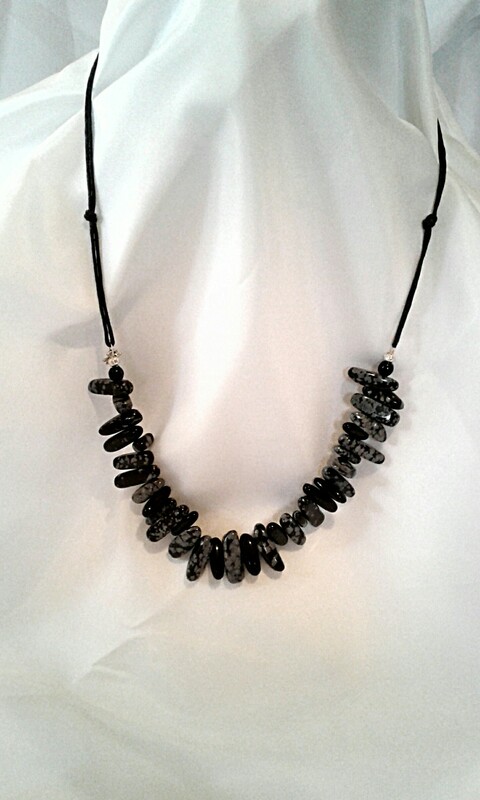 It can also shield the wearer against negativity, and is said to give protection from physical and emotional harm. Here it is cut into a set of stick beads, varying from solid black to pieces almost totally covered in gray speckles, randomly arranged for interest. The wire is captured by black cotton cording that can be secured with knots or a bow, and is adjustable from a choker fit to a statement necklace that rests against the breastbone. 26″ long at full length; Unisex; goes casual or dressy.